Seth lifted his head from the pillow. “What's all that noise?” He rolled over and looked out the window. All of the farm animals were running around confused and frightened. Seth got dressed and went outside to see what was going on. They went, “Oink, oink, oink,” and ran into the barn. A sheep ran by. “Baa, baa, baa.” Its fluffy white wool jiggled around its body. The sheep went, “Baa, baa, baa,” and ran into the barn. 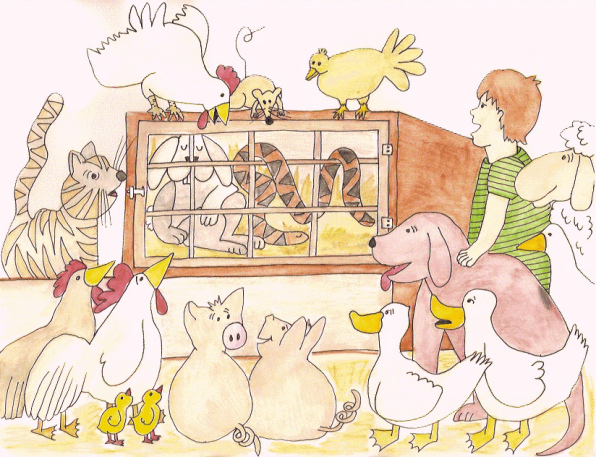 Seth saw chickens with their chicks, a turkey, three ducks, a cat, a dog and a mouse all run into the barn. “Whatever is going on is going on in the barn.” Seth ran after the animals. “Yikes,” he said when he saw all the creatures standing around the rabbit hutch. The rabbit was sleeping, snoring softly. Wrapped around the bars of the hutch was a snake. It too lay sleeping in the hay. When the rabbit woke up it saw the snake. The snake woke up and saw the rabbit and then slithered to the back of the cage, curled up in a tight coil and went back to sleep. The rabbit looked at Seth and all the animals and then closed its eyes and went to sleep. All was well at the farm once again.